The Manhattan Cocktail is one of the most recognized cocktail names, with a recipe that has remained largely stable for a hundred years. It is a strong drink – too strong for those who primarily drink wine and beer – and it amplifies rather than softens the flavor of the whiskey that is its base. The Manhattan is among the easiest cocktails to make, so it is de rigueur for your home cocktail repertoire. Add the rye, vermouth, and bitters to a glass or shaker half-full of ice. Stir until very cold, about 40 seconds. Strain into a chilled cocktail glass, and spoon the cherry in. Bulleit Rye is a good quality, reasonably priced rye. Whistlepig is a step up, but is considerably more expensive and is also 100-proof, giving a strong drink even more punch. Carpano Antica is our recommended Italian (sweet) vermouth. It is significantly more expensive than other brands, but worth it. Angostura bitters are the classic ingredient here, and we recommend them for this drink, but many other bitters can produce nice variations. We recommend Luxardo cherries; include some syrup when you spoon the cherry in. The Manhattan is just dry enough to be served as an aperitif, though it is a bit strong for that purpose. It is excellent fare at a cocktail party and goes well with appetizers. It is too strong and flavorful to drink with dinner, and should not be served as a digestif. In general, serve Manhattans earlier in the evening. Though the conical cocktail glass is the preferred container, a coupe will also suffice. For those less comfortable with strong drinks, a Manhattan can be served on the rocks in an Old-Fashioned glass. This both dilutes the drink and keeps it colder, reducing its punch. 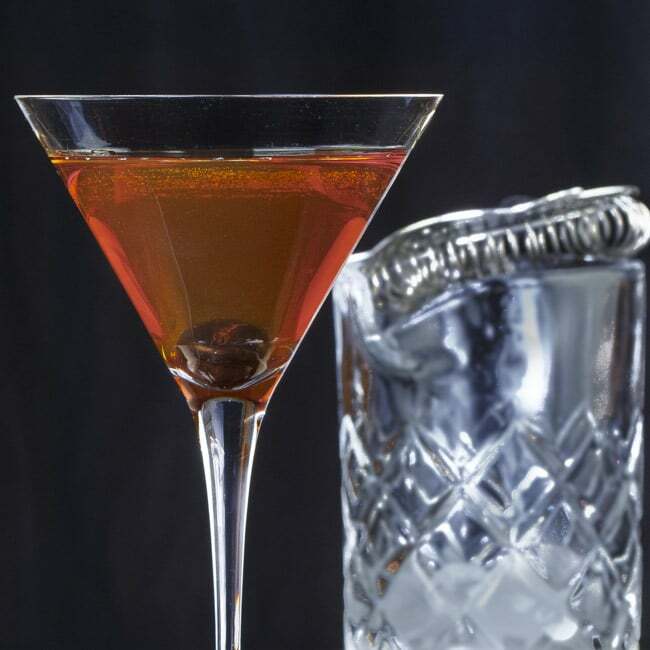 Similarly, a shaken Manhattan is slightly more diluted and usually retains a head of ice chips, keeping it colder. While these variations are not the standard, they are not at all objectionable if you or a guest find them more enjoyable. There are many common variations on the ingredients, even within a rigid template. Any whiskey can substitute for the rye; if you use scotch whisky it is called a Rob Roy but otherwise it is still considered a Manhattan variation. For many years rye was largely unavailable and Manhattans frequently were (and still are) made with bourbon. Substitutions of other base liquors (such as rum, brandy, or tequila) are popular but are really separate drinks in their own right. A common modification is to replace some or all of the Italian vermouth with French (dry) vermouth. Half-and-half is a Perfect Manhattan and all dry is a Dry Manhattan. These modifications create a pleasing color change and make the drink more appropriate as an apertif. The Dry Manhattan is sometimes garnished with a lemon twist. Substituting other fortified wines (such as Dubonnet or Lillet Rouge) is more suspect in preserving the identity of the drink but are certainly enjoyable variations. The bitters can be more freely substituted, as long as they are dark and aromatic; Peychaud’s, Cynar, Fernet, or even an amaro can serve quite well and provide a distinct change in the flavor. However, grapefruit, orange, or lavender bitters render its conformity uncertain and might not please your guests if they expect something particular. Except in the case of the Dry Manhattan, do not substitute for the cherry. Along with the color, it is the signature of the Manhattan and a substitution will cause your guests to wonder whether you confused their order. The Manhattan is a strong and satisfying drink that has been popular for more than a century, for good reason. It highlights the whiskey while providing additional flavors and a slight sweetness. It is easy to make, and if you are only having one drink, it will keep you in a good mood for the entire evening. 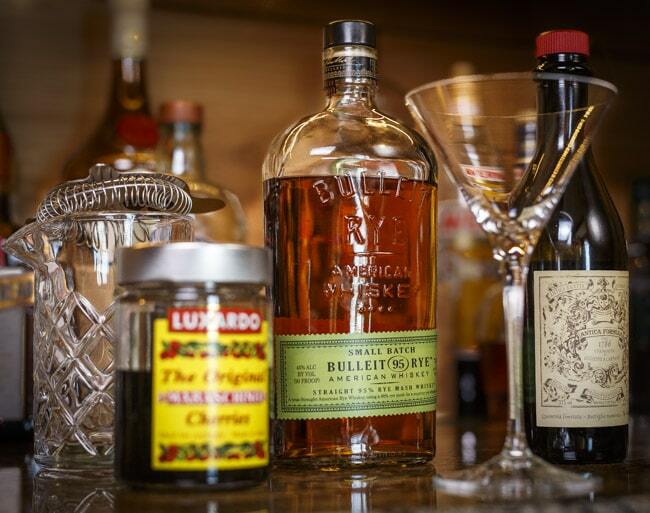 Even in an unsophisticated bar, the bartender can usually make a Manhattan correctly. Nice post and pictures! Recently, I’ve started using Fernet as the bitter in this cocktail like you mention. This substitution makes it a “Fanciulli” cocktail. It gives it a very different but still very enjoyable taste. I had never heard of the Fanciulli before. When I looked it up, recipes seem to be pretty consistent on 1-1/2 oz of Rye (or Bourbon) and 3/4 oz of Sweet Vermouth, but I see a range of 1/4 – 3/4 oz of Fernet in the recipes. 3/4 sounds pretty overpowering. How do you make it? 3/4 definitely sounds overpowering. We use 1/4 oz. Even at that amount, I was worried it might be a bit too bitter, but it ended up tasting pretty good. Great drink and great blog, BTW. I’ve bookmarked it and will be sampling your cocktails. Thanks for pointers! Nice to meet you! My name is Nick and I am a part of the D.W. Alexander team. We’re a cocktail bar in Toronto, Canada. Nice article about classic cocktail. Website also looks really tidy and professional. What do you think? I am very excited about this opportunity and I hope that you’ll embrace the idea too. Nick, this post is actually not a guest post, but the previous post on punches was. We’ve had other guest posts previously as well. We’d be happy to have you do a post! I’ll contact you via email to discuss. Thanks for reading! Switching from the old worn out tried and true Vermouths to Carpano Antico made all the difference in the world. By the way, Abbot’s Bitters made for a nice upgrade as well. Joe, thanks for the comment. Yeah, the Carpano is a much nicer taste. Sometimes, I like to make them with Punt e Mes as well – a bitter sharper in taste. In any case, new vermouth is way better than old vermouth, no matter what the brand.